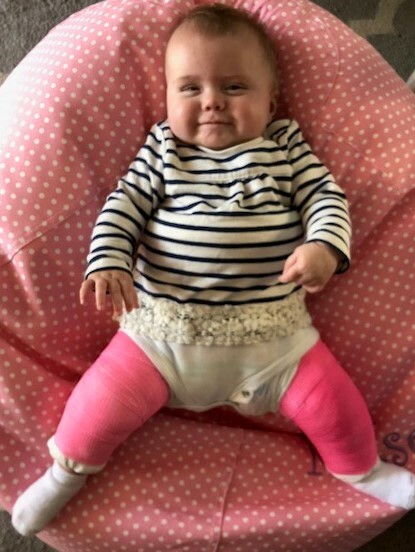 Kelsey was diagnosed with severe bi-lateral hip dysplasia at just two days old. She had to wear a pavlik harness for 6 weeks that we were unable to take on or off, which meant no baths and no swaddling! The pavlik harness typically has a 90% success rate, but after 6 weeks, we found out the harness did absolutely nothing for her. After the 6 weeks, Dr's recommended that we try a rhino brace. The rhino brace was a lot easier as we were able to remove it and wipe it clean. After 3 weeks in the rhino brace, we discovered that her ultrasound showed 0 improvement as well. In April, Dr's performed a closed hip reduction procedure on Kelsey's hips at Children's Hospital in Boston. The procedure was somewhat successful as Dr's were able to get her hips back into place and get Kelsey casted. However an hour later the cast was removed as the MRI showed that her nerve endings were being pinched and they didn't like the way the blood flow looked. In June, Kelsey had a successful 5 hour open hip reduction surgery and has been in a cast from her ankles to her chest since. Unfortunately, she will have to wear the cast all Summer, but we are hopeful that her long journey with hip dysplasia is coming to an end. Please consider donating as all proceeds will go to the Orthopedic department at Children's Hospital in Boston to complete further researching and testing! The youngest members of the Maine Gang are rooting for you! Good luck Kelsey, Kristen and Steve. Love you. Go Team! Love you!!!! Go sweet Kelsey go!!! It takes a village to raise a child and I hope you know we\'ll always be on your team. Kelsey is blessed to have such wonderful parents! Wish I could be there to join you all!